Compact and cost-effective, the KORG B1 is an excellent choice for home, stage or practice. The streamlined design delivers the features most important to any pianist: an authentic touch, superior sound and ease of use. For those who are just starting or those who want to start again, consider the KORG B1 Digital Piano. To achieve the deep, rich tones of an acoustic piano within its compact body, the B1 Digital Piano relies on KORG’s servo-assisted MFB technology, a pair of full-range speakers, plus a passive radiator. Together, these elements reproduce the rich, resonant tones that emanate from the large body of an acoustic piano, with particular attention paid to the low-frequency range. The speaker system is equipped with an active servo that controls the speaker cone, allowing low frequencies to be reproduced with minimal distortion. It achieves an ideal frequency response and reproduces lower frequencies accurately; any coloration caused by the speaker enclosure is immediately corrected. Three flavors of acoustic piano are provided along with two electric pianos, a harpsichord, and two organ sounds—each delivered with precise realism. This set of frequently used sounds lets you expand your repertoire to cover many genres. The dedicated PIANO PLAY button instantly recalls the Concert Grand Piano sound. 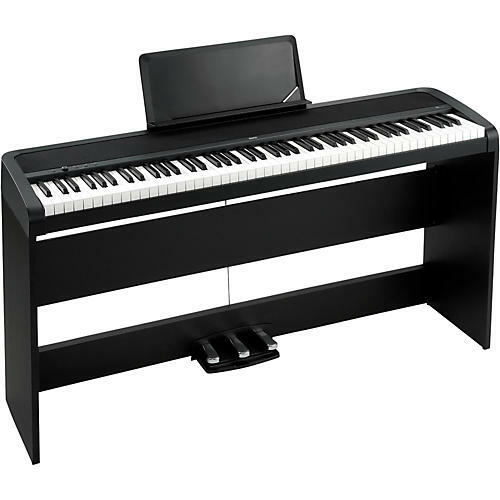 The B1 Digital Piano is equipped with KORG’s NH (Natural Weighted Hammer) keyboard action, which provides a heavier touch in the lower registers, transitioning to a lighter touch in the upper regions—just as on a traditional piano.